The team of Alexeïeff & Parker are considered to have created the first embodiments of digital film, achieved by robotically tracing swinging shiny pendulums filmed at slow exposures that left ghostly trails, what they dubbed “illusory solids,” which were compared to falling stars. Famous for his grueling pinscreen animation technique (which also resembles pixels), Alexeïeff occasionally illustrated on the side with his pinscreen contraption, such as for the opening images of Orson Welles’ feature film “The Trial” (1962). 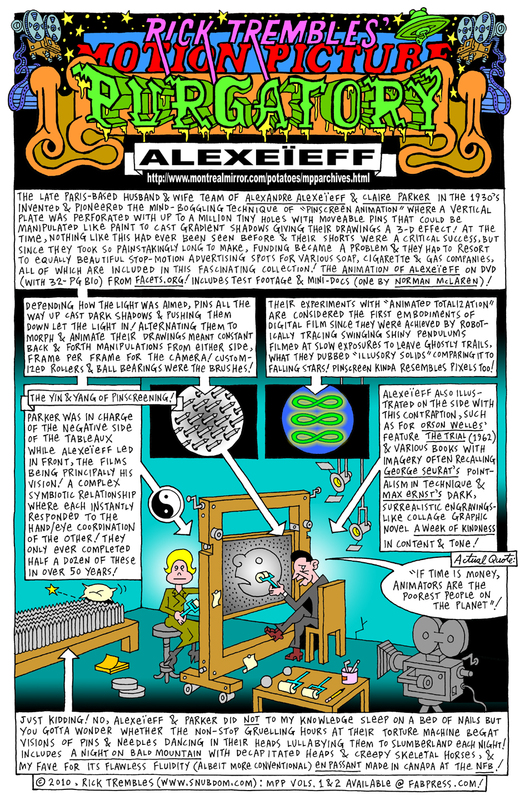 Original header for the 2010 Montreal Mirror publication of this comic strip movie (p)review: “Cozy as a bed of nails!” (To see full-sized, keep clicking on the image to open it in a new window & use the magnify function). Original art for sale for $100.00 CAD. Includes three items total: The pencil art preliminaries, the original finished B&W inks (signed & dated by author/artist Rick Trembles in pencil on the back), & a color newsprint tear-sheet (or B&W gray tones, depending on when it came out) from where it was originally published. Postage & framing not included. Motion Picture Purgatory Volumes One & Two available at FAB Press. For original art info, contact Rick Trembles @ ricktrembles (at) hotmail (dot) com.